Ran (ラン, Ran) is a kunoichi of Kumogakure. She has a short crop of brown hair and blue eyes. She wore a midriff blouse and a skirt along with a customized midriff Kumogakure flak jacket. She also wore red wrist warmers, stockings and a pair of sandals with the forehead protector of the Allied Shinobi Forces. Not much is known of her abilities but she was presumably skilled in kenjutsu as she carried a tantou strapped to her shoulder. During the Fourth Shinobi World War, Ran was assigned to the Third Division. She and her comrades were set upon by Jinpachi Munashi and Kushimaru Kuriarare and she was rendered unconscious by Jinpachi's explosion. 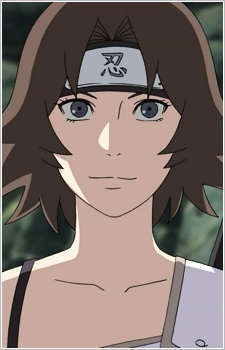 She was saved by the arrival of Might Guy and Kakashi Hatake, the latter of whom told her to flee the battle scene. She, however, later returned to the members of the Third Division and the Sealing Team leading to Kushimaru and Jinpachi being successfully sealed away.